Constance pushes the boundaries of architecture in habitable environments for space travel. Her talk introduced prototyping for spaceflight and the stringent requirements for venturing in outer space for 600+ days (manned mission to Mars). The 3/5 or “Disney scale” can work for fluid-aerodynamics, but she usually opts for full-scale modeling since material properties and human factors don’t scale really well. She introduced the many challenges of extreme environment and zero gravity living: most plastics are deadly in closed-loop environment, no convection to cool components, dull and noisy environment, etc. Our abilities to solve problems vary greatly between socio-cultural contexts and backgrounds. When confronted with the task of writing in microgravity, the Americans developed the Space Pen while the Russians used pencils. The current international space station combines the work of 15 nations, and despite divergent perspectives and interests, it has to work properly in the end. 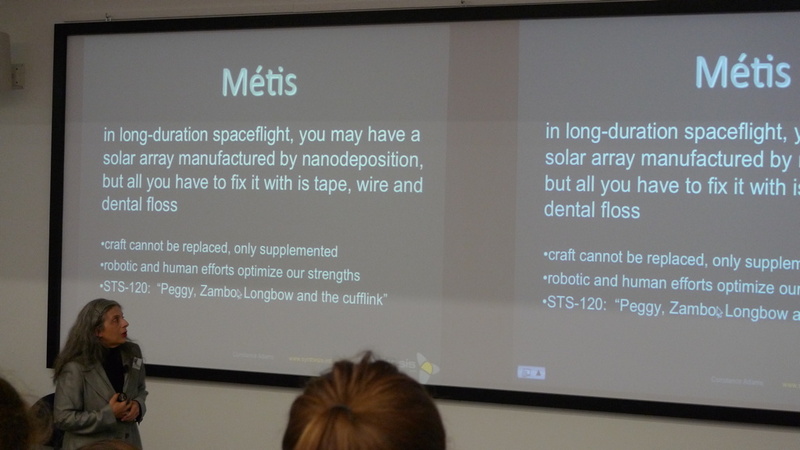 During her talk, Constance discussed various notions like open-source and DIY manufacturing (everyone needs spare parts), Métis (low-tech and craft supplementing high-tech, make do with available resources), Scrimshaw (interplanetary space travel has a lot of “down time”, activity to kill time and keep sane). She concluded with various insights about how to bring a sense of time, place and wellness into habitable space environments. By collaborating internationally to make homo sapiens astronauticus a reality, we necessarily have to understand better and reconsider our human relationship with tools and form-making beyond pure technical innovations. Open (Open Design, personalized fabrication), Niche (market of one) , Specific (solve a particular problem, specificity of devices/interfaces), Virtuosic (gestural interfaces take time to master), Sustainable (local production, knowledge about sourcing). He characterized today’s crafting and prototyping activities as the Cathedral & the Bazaar (adapted from Malone, Laubacher, Dellarocas’ Collective Intelligence Genome). The reality is probably never as strictly polarized, but I found the comparison interesting. 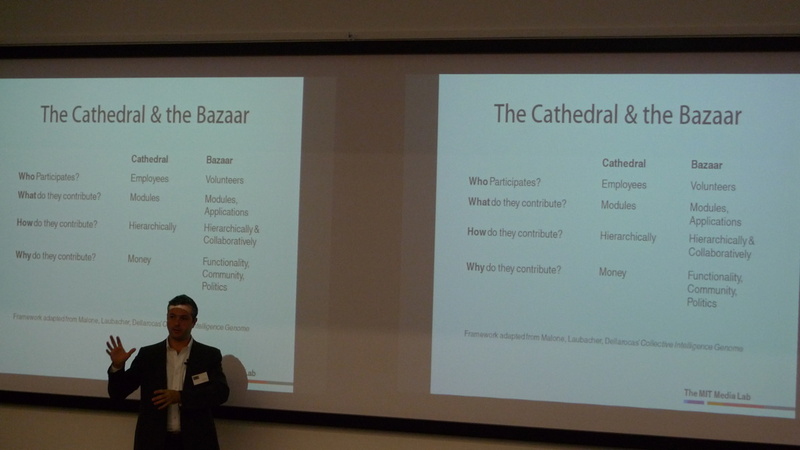 Many questions and comments touched on the issue; one asking if Bazaar-like work can really reach Cathedral-like proportions/qualities, and another suggesting that all Cathedral type of organization have Bazaar-like activities internally. Finally Leo introduced sourcemap.org, a webservice exposing supply chains data to support sharing and sustainable awareness. 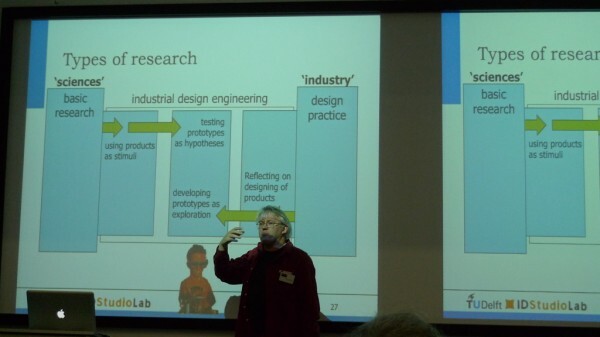 Hazel introduced Dunne’s notion of “Genotypes” and how it provides a new way of working for the craftperson. She also brings Design Fiction (Julian Bleecker) and asks if we ought to have Craft Fiction now: to explain, to imagine, to materialize ideas, to speculate about a different kind of world. She then followed with a recent craft project realized in the Shetland Islands. She got acquainted with local craft knitting knowledge, and out of this built a small interactive kist (wooden chest) reuniting elderly locals with their remote family members. M. Schrage (author of Serious Play) is interested in Behavioral Economics. He started by defining that there are two types/approaches to prototypes: “Show & Tell” vs “Show & Ask”. These are stereotypes but they are present and valuable in today’s world. He then tried to define Craft: Craft as/is “skillful making” of what…? I found his talk terribly interesting, especially the notion of Marketplace. My notes are skim unfortunately. He ended his presentation mentioning that our challenge is to nurture and craft those “Playful Prototyping Marketplaces”. 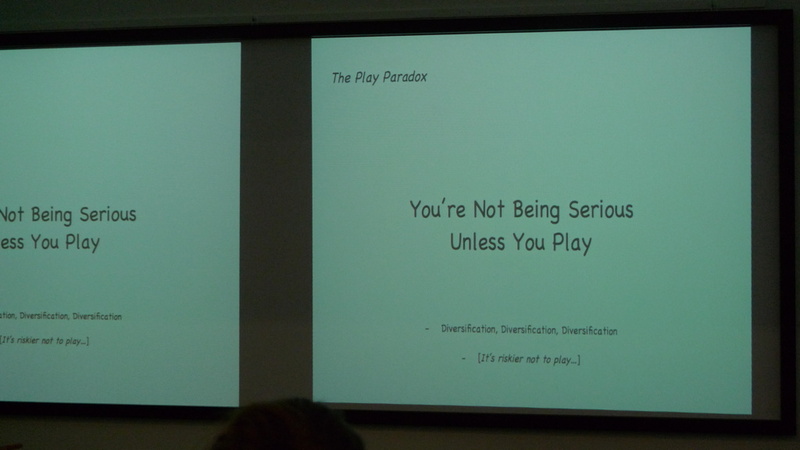 Note to self; check his slides and possibly his book for numerous definitions of play and its relation to innovation + knowledge building. How prototypes relates to furniture design in the 80’s with Memphis pieces. These were one-off, hand-crafted prototypes made to bring new radical esthetic ideas to the world. 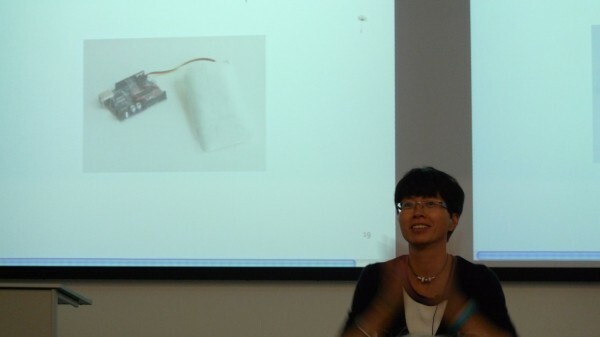 Her presentation was very similar to the one I attended in Seoul (Korea) in October 2009. Elizabeth’s work relates heavily to UCD and PD methods. Her table depicting old and new practices was interesting (sorry not picture). It shows the complexity and multi-disciplinary nature of new design activities. Her Participatory Prototyping Cycle contains three interconnected nodes: Make, Enact and Tell. Elizabeth associates various verbs and actions to these three facets (see image). A presentation of the CoS collective, their work and practice in contemporary art. 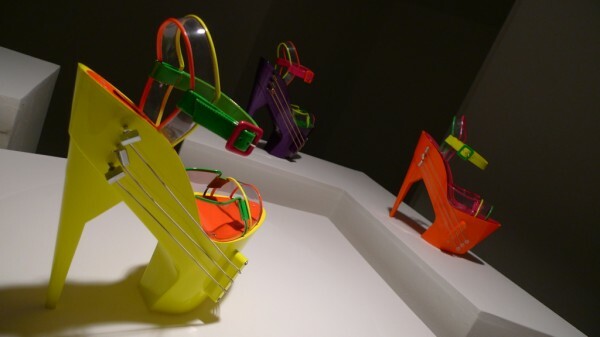 The group recently created a high-heel shoe that can be played like a guitar. It has the necessary electronics, and is solid enough to be worn. It proved quite challenging for CoS to bring qualified collaborators into this project due to personal ego and heavy technical requirements. His talk was titled “Prototopia: Craft, Type and Utopia in Historical Perspective”. He examined the meeting point of Prototype and Utopia, dissected the model of prototyper, and revisited the “mechanical selection” from Le Corbusier. 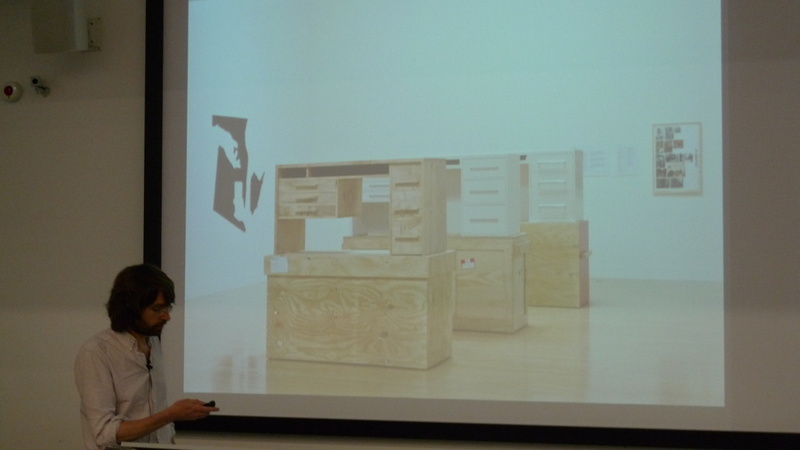 He talked that prototyping is an interesting form of bricolage, as it is a combination of production and consumption. Simon presented a selection of projects and his perspective on prototypes and craft. For him, prototyping is more a mindset and an omnipresent sensitivity to understand and use the present situation. He presented a first project where he took two aluminum objects, a bike and a chair, and rebuilt each of them using the other’s raw material. He then showed D1Z1, a high-end stop motion CG film about a first-generation analog computer. The old and new blends seamlessly and beautifully. The last project he presented was a film + installation for Wilhelm Noack oHG, metal fabricators in Berlin who made some of the finest metalwork of the 20th century (Bauhaus and numerous International Modernism pieces). Mr. Brown is a biomedical engineer. His presentation was insightful and though provoking. He described his current practice and labeled it Prototyping for High Value and Time Poor users. He works with a world-renowned surgeon, and this situation brings unique considerations for the design process of new tools and systems. As always, everyone has overt and covert objectives in their work. He questioned the role of computation in his current practice, and highlighted that is still very difficult to model human characteristics on a computer with any useful complexity. Mr. Brown then proposed a new form of activities, called abstract prototyping. He argues that is not really new, but tries to motivate and define its values and usefulness. His client (the world-class surgeon) has good abstract skills, so maybe it would be appropriate to use more abstract prototypes. He finished his talk highlighting that medical projects can afford high-end prototyping techniques, but also that they need to consider all stakeholders (famous surgeon, cleaner, buyer). As an engineer, his practice is clearly specifications driven, but he noted that they should not make you blind. Pieter’s presentation placed prototypes as central vein of knowledge. Development. 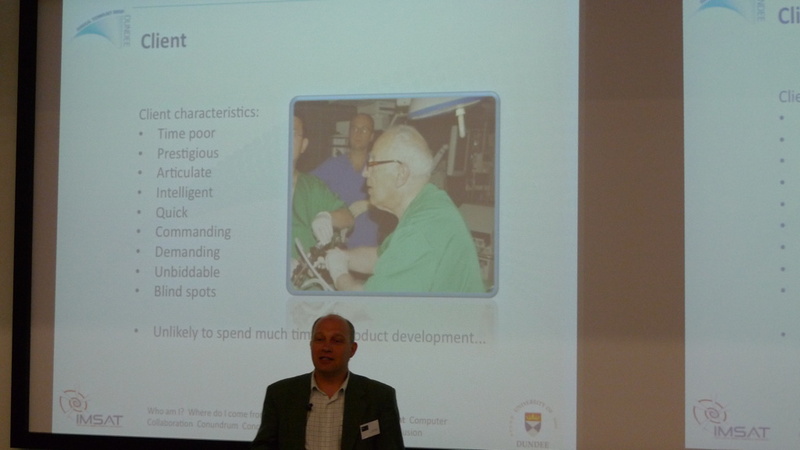 He first introduces many definitions of prototypes (see image). He ran a little experiment with the audience (based on Wason’s experiment) to show that we are pretty bad at Abstract Thinking. He then reviewed the how natural sciences and industry + design disciplines are using prototypes to advance knowledge and projects. The uses of prototype are different and equally valuable. He commented the society tends to ignore the creative and bazaar-like activities underlying classic scientific pursuits. 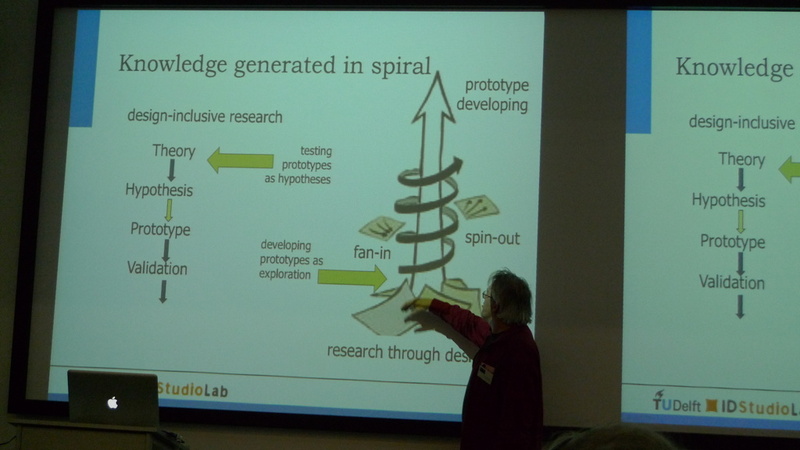 He explained how design-inclusive research uses prototypes to generate knowledge. He showed a few projects, around the visual environment of designers. He critiqued the fact that now most designers only have a small screen as ambient visual environment. He explained how his team has been developing VR solutions to this problem. Personally I’m not so sure of the reliance of VR to augment ambient visual stimulus. Analog stuff works incredibly well and is infinitely reconfigurable. 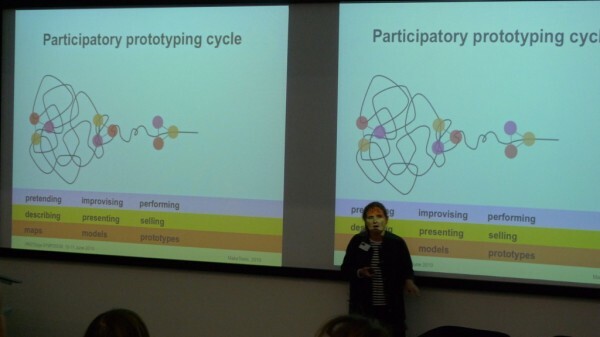 She presented her Rip & Mix method to design process. Rosan exposed her thought process and various design methodologies supporting her work. 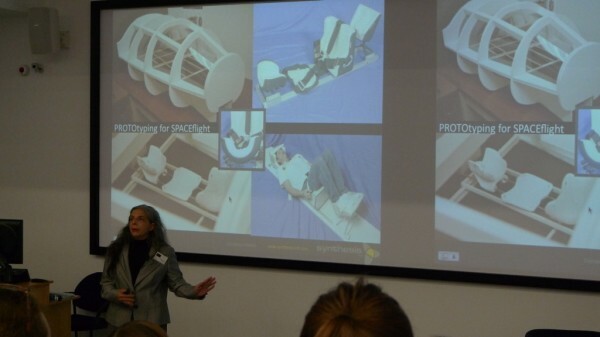 One aspect I found interesting was how her method and view of prototypes aim at supporting case-transfer. How one can transpose knowledge between projects, situations, disciplines: local, regional and long-distance transfers. 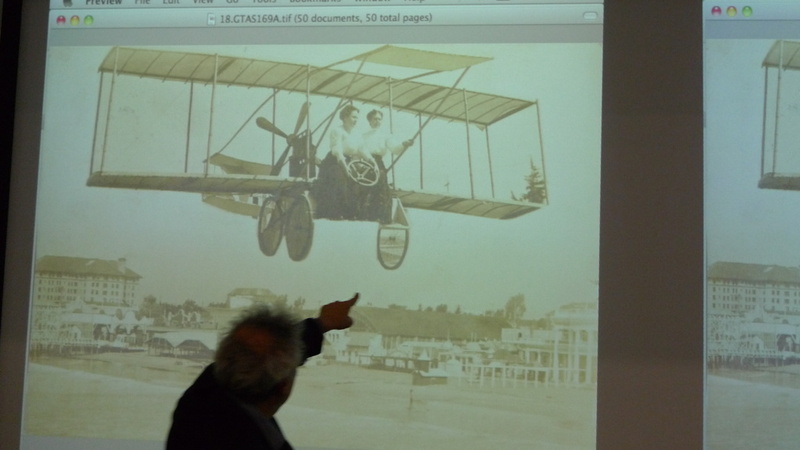 Normand’s talk consisted of mind-blowing visuals from the past. They depicted how people viewed the future and the various aspirations. He summarized the current state of prototyping as “cross-embedding media”. He said that the future of media is “the local, the haptic, the hand-made”. I’m not so sure how to describe the rest of his presentation other than inviting you to browse the gallery at http://www.imaginary20thcentury.com.